Bulk bag of quality, affordable landscaping & playground woodchip – produced from sustainably sourced local timber, free from contaminants. A bulk bag can hold roughly 0.75m3 of woodchip. If you have this item delivered, it may be delivered in multiple bags to make it easier to unload. Woodchip can be used for a variety of projects in the garden, from landscaping paths to creating safe playground areas for children. Our carefully selected feedstock is handled by our skilled and trained staff, using only well-maintained and fit-for-purpose specialist equipment. We also have a strict policy of not allowing waste wood or non-virgin wood on our site, to avoid any contamination. We chip onsite and use only timber that comes from the Greater Manchester or surrounding area. Our sourcing policy really sets us apart, as our aim is to make beneficial use of arisings that would otherwise likely not be used in an environmentally efficient manner. We currently supply several local allotments and growing projects, including some delivering a social benefit, such as the HEAP (Highfield Eco-Allotment Project working with asylum seekers and ex offenders). Our woodchip is similar to our biomass chip, with a chip size of 5-30mm as recommended by BS_1176_2008. Woodchip has excellent impact absorbing properties and tends to be more durable than bark chip. It is free-draining and low dust content, odour and contamination free, and easy to dispose of via composting. Our bulk bags hold around 0.75m3 of woodchip. 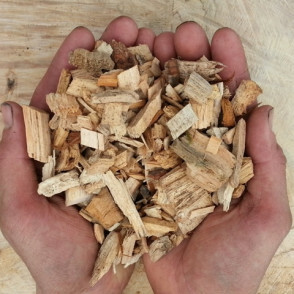 Woodchip helps suppress weeds, stabilises soil temperature and retains water, whilst some leaf content improves soil fertility, as it re-balances the Carbon/Nitrogen ratio when it eventually breaks down. We can accommodate tipped or bulk bag deliveries within Greater Manchester, and we can crane large quantities over walls to save you moving chip about. Just contact us to discuss your requirements.